George Graham Reviews Al Basile's "The Tinge"
The blues is such an influential style that it sometimes lends itself to stereotyping, especially in the popular view of the people who play the blues. Obviously, the blues arose from the African American experience, and for most people and the main instrument of blues players is the guitar. There are also the clichés of bluesmen such as the main characters in the Blues Brothers movie. But this week, we have a first-rate blues-based album by a performer who defies the stereotypes. 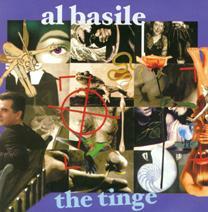 It's the new CD by Al Basile, called The Tinge. Al Basile is a blues songwriter and vocalist whose instrument is not the guitar, but the cornet, a variation on the trumpet that was played by Louis Armstrong and others. Basile started out in college majoring in theoretical physics, but decided instead to turn to English and writing. He was the first to receive a master's degree from Brown University's Creative Writing program. While an undergraduate in the late 1960s, he also wrote theaterical musicals. In 1969, he met guitarist Duke Robillard, who was in the process of founding Roomful of Blues in Providence, Rhode Island, a band that continues to this day. Basile officially joined the band in 1973, and appeared on their seminal debut album. During his tenure with them, Roomful performed with many great bluesmen who sat in with the group, including Eddie "Cleanhead" Vinson, Big Joe Turner and Helen Humes. Basile also wrote for the band and for others, including Ruth Brown. He left Roomful in the mid 1970s, but continued to perform and record as a sideman, including on several albums by his old Roomful of Blues colleague Duke Robillard. Basile made his first solo album in 1998, and has been recording since then for his own label. His new release The Tinge reunites him with some of the early members of Roomful of Blues, including guitarist extraordinaire Robillard, plus saxophonists Doug James and Rich Latielle. Also appearing is a stellar rhythm section including keyboard man Bruce Katz, bassist Marty Ballou and drummer Mark Teixiera. The result is a kind of revival of the sound of early Roomful, with new original music that harkens back to the sound of the late 1940s or early 1950s, when the term "rhythm and blues" meant music from the likes of Louie Jordan or Wynonie Harris. The playing on the new CD is great, and Basile's vocals are quite appealing, and in fact, are quite similar in style and timbre to those of his friend Robillard. The title of the album, by the way, is a reference to the term the "Spanish tinge" that Jellyroll Morton used in describing the rhythmic figure that formed the basis for some early jazz and was influential in everything from rumba to some early doo-wop. Al Basile's new CD The Tinge is a outstanding blues album with a twist -- the singer and songwriter plays cornet instead of guitar, and writes with a more lyrically literate touch, given Basile's academic background. The CD brings back together several of the early members of Roomful of Blues and is a reminder of how great the early version of that band was. The project covers a fairly broad range of blues-based styles from swing-era to Memphis or even Motown-influenced soul. The band is outstanding, especially guitarist Duke Robillard, and Basile gets a chance to solo on his cornet on most of the tracks. A blues album consisting of all new original material is also rather uncommon. Our grade for sound quality is about an A-minus. The mix has everything in the right place, and the clarity is generally good. Thankfully, there was not much of an attempt to re-create the less-than-audiophile sound quality of old blues recordings, which seems a popular thing to do these days. The dynamic range, preserving the span from soft to loud, is mediocre. Al Basile has been playing the blues since the early 1970s, mainly as a sideman, the usual position for a trumpet player, but on his latest album, he shows himself to be an impressive performer and songwriter. The album also brings us more of the great horn-drenched jump blues that is the trademark of Roomful of Blues, and for me, one can never have too much of that.